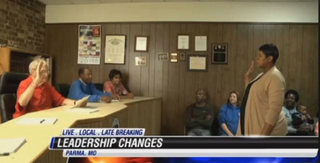 There were only six police officers in Parma, Mo., and after the small town voted in its first African-American female mayor, five of them resigned. According to KFVS, Tyrus Byrd beat incumbent Randall Ramsey, who had served as mayor for some 37 years, by 37 votes. After the election, in addition to the police officers, according to the news station, the "city's attorney, the clerk and the waste-water-treatment plant supervisor also turned in resignation letters citing 'safety concerns.'" "I think it's pretty dirty they all quit without giving her a chance," resident Martha Miller told KFVS. "But I don't think they hurt the town any by quitting, because who needs six police for 740 people." Byrd was sworn in April 14 and has refused comment about the abrupt resignations since winning the election. The new mayor, who was born and raised in Parma and has worked as a city clerk and missionary, told the news station that she will look into the "safety concerns," and added that her first order of business is cleaning up the city.